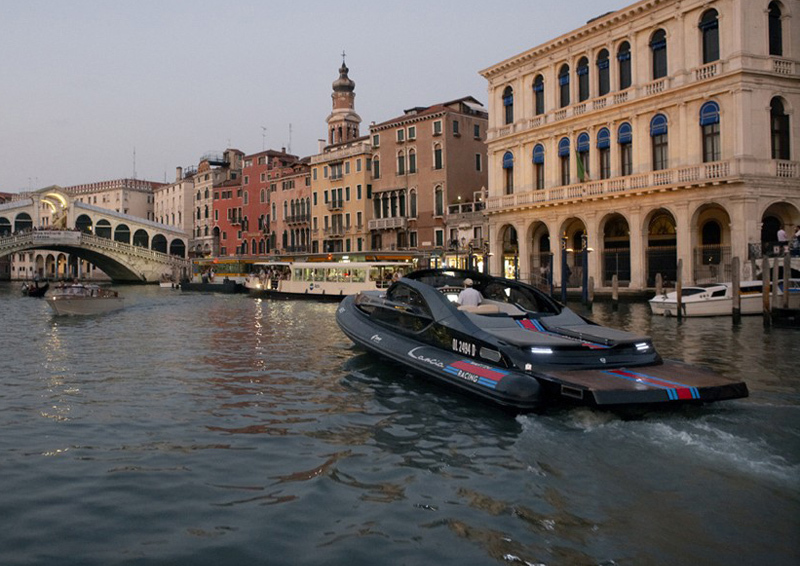 The Lancia Powerboat which was unveiled at the 2009 Venice Film Festival is the result of a collaboration between four Italian companies. Sacs - who produce luxury RIBs, FPT (Fiat Powertrain Technologies ) who are Fiat's subsidiary company specializing in powertrain development, Martini - a regular sponsor of Lancia race vehicles, and of course Lancia. 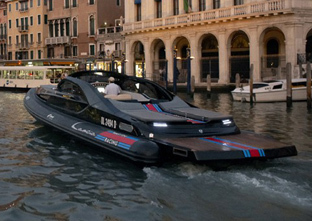 The Lancia Powerboat has been designed to offer the comfort and style of a sports coupe in a boat. 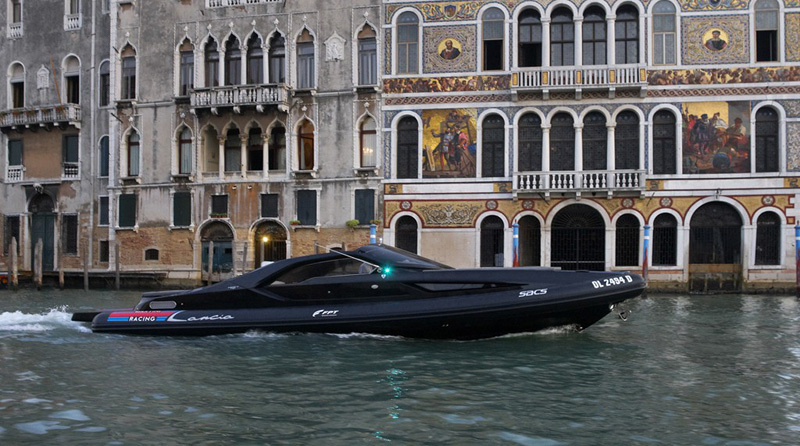 The construction was carried out by Sacs, following the design of Christian Grande, one of today's most talented boat designers. 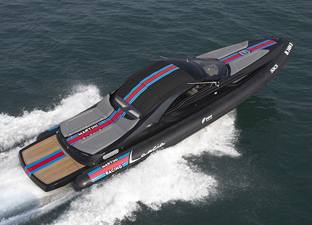 Each Lancia Powerboat is unique, manufactured industrially, but finished with all the care and attention of a master boat-builder. The fibreglass hull is made using moulds finished by robot milling machines. Every component is then assembled and installed by hand to permit each boat to be personalized to customer specifications. 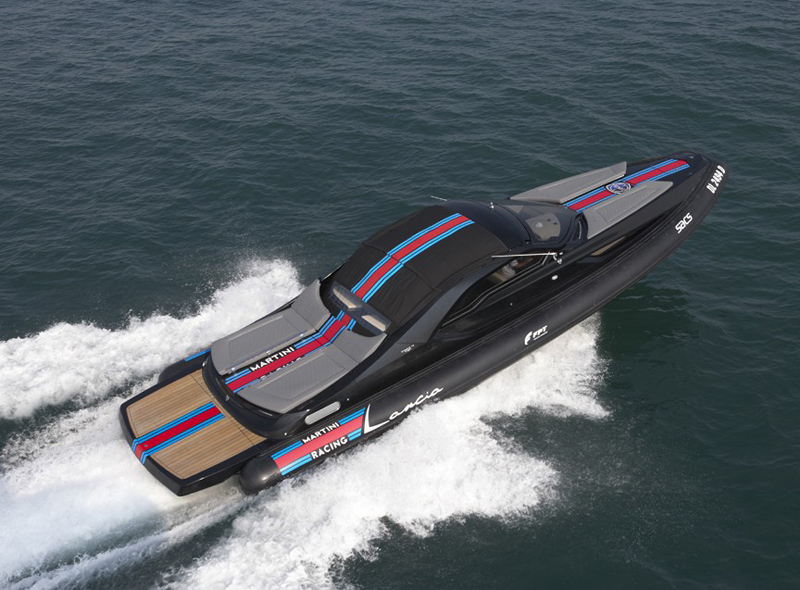 The 13.1 metre (43 feet) length and 3.8 metre (12.4 feet) width of the Lancia Powerboat offer a combination of performance and comfort. 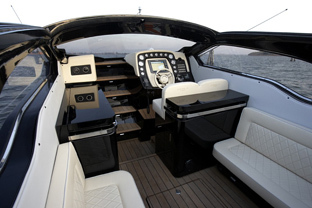 The shallow draft of just 0.80 metres (2.6 feet) allows the craft to traverse shallow waters. 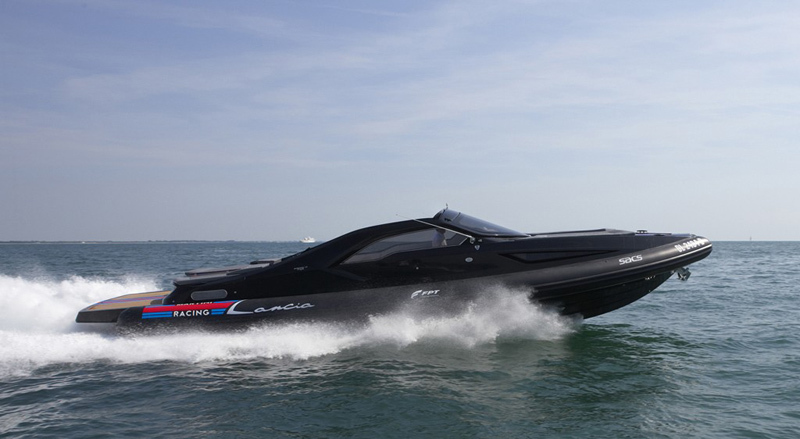 The Lancia Powerboat can carry up to 11 persons, and has a cabin to sleep two. 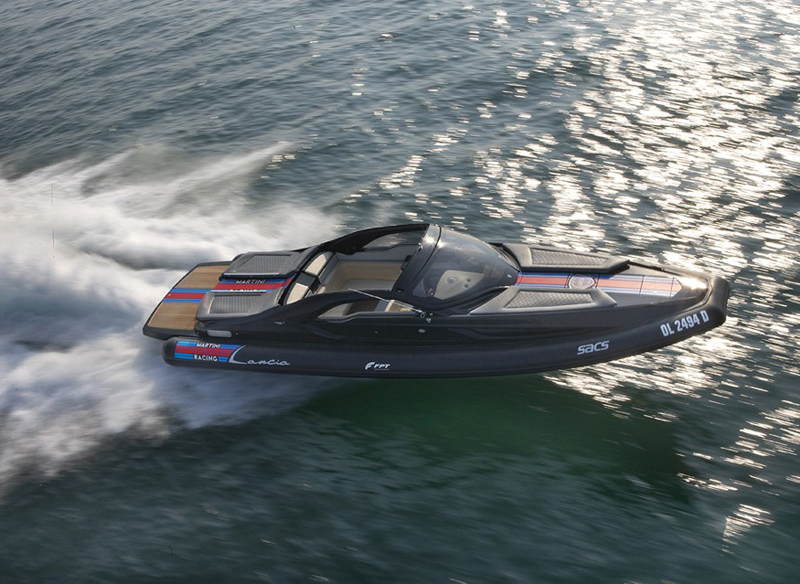 The Lancia Powerboat has a folding, electric-powered hood which can be raised to protect the occupants from the elements, this has been designed to fit flush with the boat's lines and provide a low profile that accentuates the vessels sporting character. The bow deck incorporates two sunbathing mattresses located either side of the central walkway that leads to the bow for passengers to embark and disembark. In the same way, the engine covers at the stern are upholstered to create a second sunbathing area, with another walkway leading to the bathing platform. A foldaway LCD television and a galley kitchen complete the cockpit equipment. In the cabin, furnishing is characterized by modern shapes and materials, and the lounge converts quickly to a double bunk. Air conditioning lets you escape from the heat of the sun and cool down. Bathroom facilities are minimalist but impeccably finished. 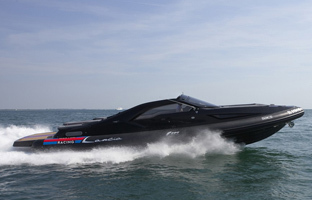 The RIB tubes of the Lancia Powerboat are largely incorporated into the hull, emerging only where their presence serves to facilitate maneuvering in tight spaces without the need for fenders. The tubes also ensure unsinkability by providing a number of separate air compartments. Rows of LEDs under the transom and front windscreen simulate the appearance of modern Lancia car lights. 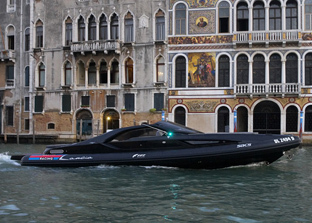 The Lancia Powerboat is powered by a pair of FPT N67-560 engines. These produce a combined output of 1120 horsepower which gives the boat a top speed of 55 knots and a cruising speed of 15 - 45 knots. Two buttons on the throttle levers modify the propulsion angle to move the screws higher or lower in the water. This changes the angle of the hull with respect to the surface of the water, increasing speed or stability in rough water. 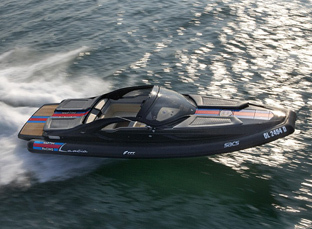 The hull is derived from a Sacs racing prototype, and does not need flaps, making it especially easy to drive. The engines are controlled by electronic levers that operate the throttles and smoothly engage forward and reverse propulsion.